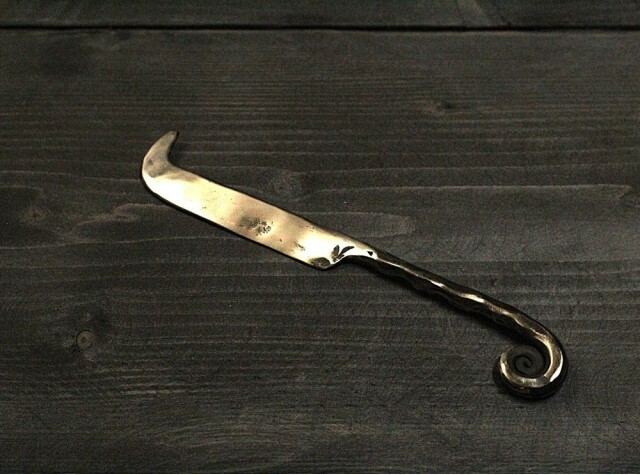 A unique, hand forged stainless steel cheese knife, made by a professional blacksmith in Carmarthen.Each cheese knife is unique and stamped with the initials of its maker, Ferric Fusion. They also have decoration carbon marks, which are a result of the forging process.Real skills, real quality. A unique, hand forged stainless steel cheese knife, made by a professional blacksmith in Carmarthen. Each cheese knife is unique and stamped with the initials of its maker, Ferric Fusion. They also have decoration carbon marks, which are a result of the forging process. Ferric Fusion is a family business, handed down through generations and has been run by blacksmith Aaron Petersen and his brothers in Carmarthen. Aaron Petersen has been a blacksmith for over 20 years and is inspired to create ironmongery which is both practical and beautiful.